Upon submitting your username and password, you will see the Basics view. 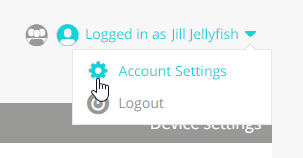 Click on "Logged in as <Your Name>" in the upper right corner. Make any adjustments you desire and click "Save"
You will see "All changes saved." appear below the save button. Congratulations! You just updated your Account Settings. Remember to use your new email or password when you login in the future!